Tamales are time consuming to make, they just are. Sometimes cornhusks (or banana leaves) are hard to find. 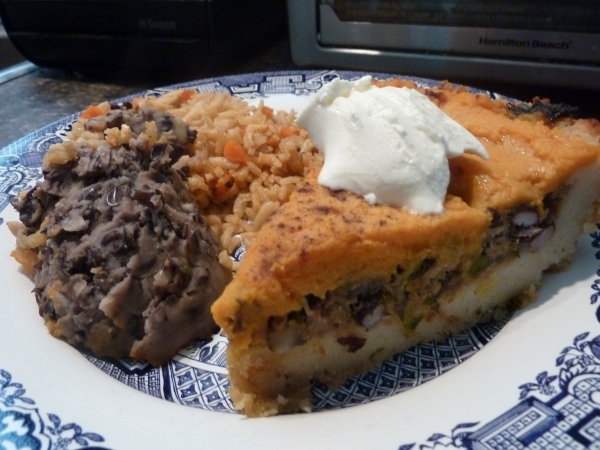 I’ve heard of Tamale Pie but have never tried it. It seems like a made-up/Americanised version of Mexican food. When I looked up a few recipes I shouldn’t have been surprised, No masa anywhere, in the recipes they were all made with Cornbread or cornmeal!? So I decided to make what I thought a Tamale Pie should be. I started with a half-batch of a real tamale recipe (Tamale recipe from MaSeCa.) We had some left over slow-cooked pork, for the ‘filling’, super easy. I turned it into a shepard’s pie because we need to get our vegetables in somehow. Plus, Baby girl loves sweet potato (and it’s really good for you). I finished it off with a sprinkling of cinnamon and topped with a dollop of sour-cream. The tamale is baked instead of steamed, but I think I may have liked that even more. It give the masa a really fried feeling and a richer taste.